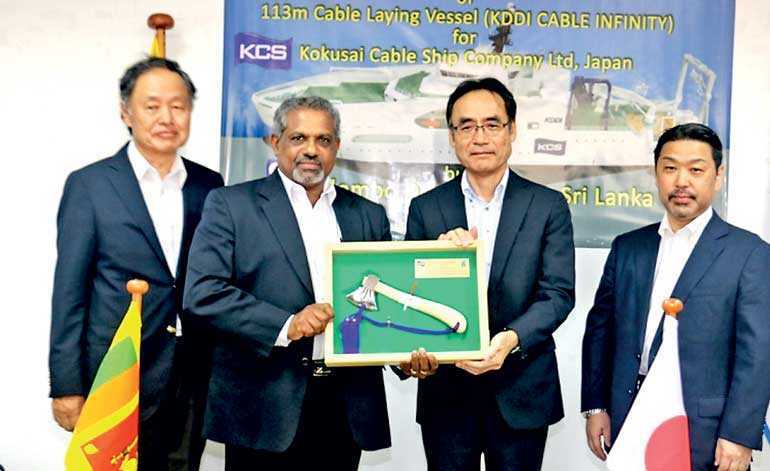 Colombo Dockyard PLC (CDPLC) yesterday ceremonially launched the first ever Cable Laying Vessel being built for Kokusai Cable Ship Co. Ltd. (KCS) Japan. This is the biggest ever vessel, in terms of price as well as length, to be built by CDPLC in its illustrious journey of shipbuilding excellence, and the first ever ship built in its class from Sri Lanka to Japan. The ceremonial launching of a vessel is the process of transferring of the vessel to the water for the first time, by breaking a milk over the ship’s bow area and inviting good luck to the vessel, the crew, and the owners. The ceremony was graced by KCS President Takaaki Anraku, KCS Managing Director (Engineering & Facility Planning Department) Yukihiro Fujii, KCS Deputy Director Shigeyuki Sato, KDDI Manager Hitomi Kumazawa, MOL Ship Tech Site Manager Hiroshi Shimotai, Masanori Kato from MOL, and a host of other distinguished officials from Japan. 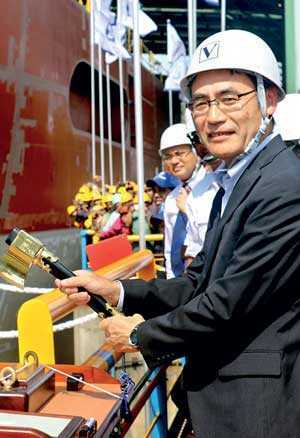 Representing Colombo Dockyard, Chairman Dr. Toru Takehara, MD/CEO D.V. Abeysinghe, Director K. Utsumi, Alt. Director K. Kanaya, Advisor H. Tanaka, Y. Kijima, the corporate management team, and staff participated. ClassNK Regional Manager for South Asia Dr. Abdul Rahim also participated. This Cable Laying Vessel is a high technology vessel, which is intended for subsea operation and cable installation, and repair works of optical cables as well as power cables, adding to the versatility of the Vessel. For the handling of power cables, the forward tank has been fitted with a carousel system with a Spooling Arm. The vessel is specially designed and equipped with a focus on maintaining good sea-keeping ability and excellent station-keeping performance. Passive roll reduction tanks help minimise the effect of ship rolling. The vessel has many special features, including low resistance hull lines designed for speed, and low fuel consumption. The vessel is extremely eco-friendly, enabling high reduction of harmful emissions, waste storage solutions, water ballast treatment, eco-subsea coating etc. The vessel is diesel-electric driven and has optimised power, which is another key feature. Power is provided by four generator sets, developing 2,250 kW each. Three generators out of the four available are sufficient to cope with the highest propulsion power demands, ensuring high reliability. Transit at economic speed with two engines efficiently running will optimise fuel consumption. The vessel shall have a bollard pull of 80 tonnes, with a range of 10,000 nautical miles, and has Dynamic Positioning capability to Class 2 for precision manoeuvring. The basic design and production drawings for the construction are supplied by VARD Designs, Norway. This Vessel is being built and is classed by ClassNK and meets the regulatory requirements of the Japanese Government. This vessel, which is 113.1 meters in length, 21.5 meters in breadth, 8.8 m depth, with a maximum load laying draught of approx. 7.1 meters, has a deadweight carrying capacity of 5,300 DWT and a planned average cruising speed of 14.5 knots with accommodation facilities for 80 persons. Colombo Dockyard PLC is a flagship investment of Japan and operates in joint collaboration with Onomichi Dockyard Company Ltd. of Japan. Sri Lankan Government institutions hold more than 35% stake in the Company. Colombo Dockyard PLC is Sri Lanka’s front-runner of its industrialisation drive.